Australia warm up for next month’s World Rugby U20 Championship 2016 with a first-ever victory over New Zealand at under-20s level. Australia have defeated New Zealand for the first time at U20s level with a 25-24 victory in the second match of the Oceania Rugby U20 Championship at Bond University, Gold Coast on Saturday night. In the thrilling and brutal encounter the young Australian side shot out to an early 22-3 lead, only for New Zealand to score 21 unanswered points in the second half. A penalty in the last minute of the match allowed fly-half Mack Mason to steal victory for the Australians, sparking scenes of jubilation on the field. Saturday’s victory squared the two-match series after New Zealand recorded a 30-10 victory in the first encounter. “I’m proud of the way we came back after Tuesday, we kept a high work load during training and the way we came back in those last few minutes was very pleasing,” said Australia head coach Adrian Thompson. “I think they showed belief more than anything tonight. I don’t think they believe in their own ability enough. Australia started the match in strong form, pouncing on a loose ball from New Zealand and patiently building phases in the New Zealand 22. The Australian backs worked the ball through the hands until sevens convert Simon Kennewell scored in the corner. Mack Mason converted from the sideline to give Australia an early 7-0 lead. Australia continued to maintain possession and earned a penalty from 50 metres out, which Mason converted to take the score to 10-0 in favour of the young men in gold. New Zealand found their form and pounded the Australian line for multiple phases but were unable to cross the try line. Jordie Barrett settled for a penalty kick when the Australians infringed taking the score to 10-3. Australia made a daring run through the New Zealand line thanks to a deft step by full-back Jack Maddocks that put the hosts in New Zealand’s 22. 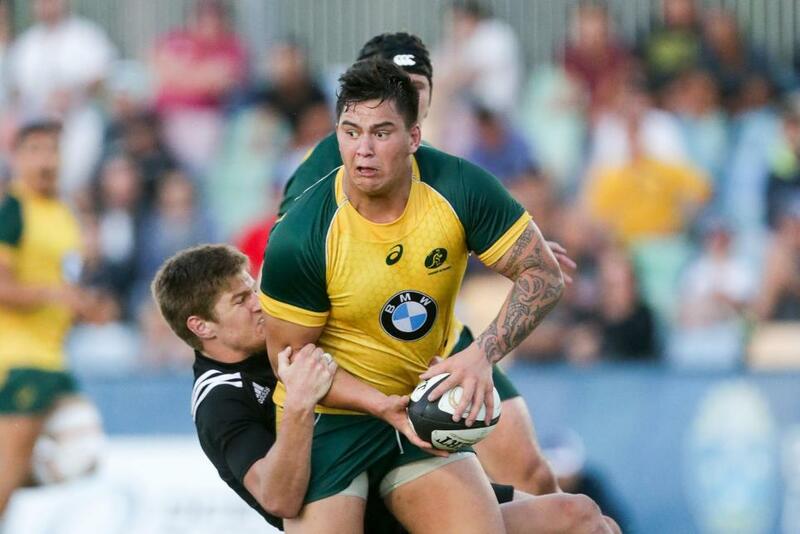 Australia’s forwards worked hard against the Kiwi defence eventually allowing Izack Rodda to score in the corner. Mack Mason converted the try to take the score to 17-3 where the score remained at half-time. "We have had a tough three years in terms of our schoolboys losing to the Kiwis, which has hurt our confidence with New Zealand and hopefully this win goes a little way in turning that around"
The first try of the second half went to the Australians when a line break from Harley Fox created a try for Joey Fittock. Trailing 22-3, New Zealand countered with a try of their own shortly afterwards with Caleb Makene breaking through the Australian line to score. New Zealand continued to chase the game and scored two quick tries, including an intercept to take a two-point lead, at 24-22, with 10 minutes left in the match. With the clock counting down, the Australians desperately fought to get the ball back from New Zealand as the Kiwis held possession. A steal from within in their half allowed Melbourne Rebels centre Sione Tuipulotu to make a solid break through the line and the Australians patiently built phase after phase on the visitors. With the final minute of the game upon them, New Zealand infringed at the breakdown and Mason calmly slotted the penalty to seal a remarkable victory.